This botanical tapestry, Garden Celebrations, is a work celebrating the beautiful elements found in nature's garden. It is a work of contemporary artist Jennifer Hollack. She has produced many works combining the elements of nature, with leaves, flowers and buds arranged into a design such as the one seen in this tapestry here. Her natural eye for beauty is evident in this piece here which shows a focal point of a more intense red and a hint of purple close by with the acanthus like leaves of green and very ingeniouly blue-green, which adds another dimension of color to this already beautiful work. 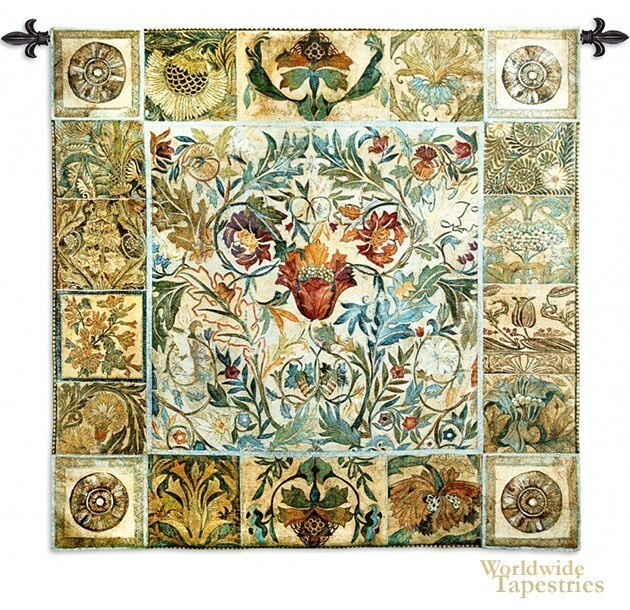 This tapestry is backed with a lining and comes complete with a tunnel for easy hanging. Note: tapestry rod and tassels, where pictured, are purchased separately.